Take your kids to see their "kids" on the Goat Walk at the Westmoreland Berry Farm! Job Fair April 5-6, 2019! Applicants must be available on weekends, including Mother's Day. If you love the great outdoors and are interested in being part of a family-centered, agri-tourism team, please stop by our Farm! Information about each position will be available. 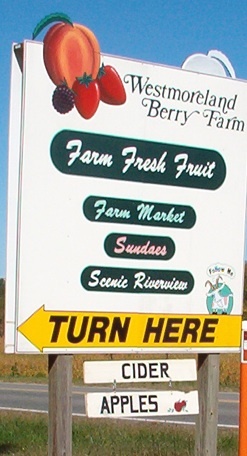 At 1235 Berry Farm Lane, you'll find what's known as the Westmoreland Berry Farm in Oak Grove, just outside of Colonial Beach. In 1608, Captain John Smith visited a small Indian village here on the farm! This place has much more in store than what the name implies. There are orchards, a gift shop, an amazing "goat walk" and the adjacent Voorhees Nature Preserve. You'd never guess that they've only had electricity here since 1983! The "goat walk" is very cool. Seeing those little guys navigate that bridge high off the ground is a lot of fun. It's even interactive, as there is a system rigged up so you can feed them up there. Their Gift Shop is large and there are so many items to choose from. I recently tried the Strawberry Salsa which was really tasty. My hubby said the hot apple cider was some of the best he'd ever tasted, and he went back for seconds. Not in the mood for cider? No problem! At their take-out window, you can also order sundaes, shortcakes, hot dogs, BBQ, chips, and other drinks. Ready to roll up your sleeves and get to work? The pick-your-own fields are typically open during part of the season daily until 3:30pm. Be sure to call ahead and confirm just in case. Selections include Apple Butter, Damson Preserves, No-Sugar Apple Butter, Blackberry, Blueberry, Cherry, Peach, or Strawberry Preserves, Onion Blossom Horseradish Dip, Peach Butter, Peach Salsa, Pumpkin Butter, Strawberry Butter, Vidalia Onion Creamy Cucumber Dressing, Vidalia Onion Peach Hot Sauce, Vidalia Onion Steak Sauce, Vidalia Onion Summer Tomato Dressing, Zesty Vidalia Onion Relish, Westmoreland Preserves: 11 ounce jar in Blackberry, Cherry, Peach, Red Raspberry, Royalty Raspberry and Strawberry, Westmoreland Seedless: 11 ounce jar in Blackberry or Red Raspberry. From Colonial Beach, take Route 205 to the stoplight at Route 3. Turn right and go for a couple of miles. Turn left onto Claymont and follow the signs. You can also get there by not turning at the stoplight, but going straight through at the intersection of Routes 205 and 3. Watch for the signs on the right.